These Recycled Plastic Pitch Markers are used to colour code caravan pitchs or bays and other caravan site related areas on caravan sites. The post has a steel spike for securing in the ground allowing them to be easily moved as necessary. They will never rot and will last for decades. UV protected to a high level against fading. A no nonsense Recycled Plastic Bench with extended legs designed for sinking into concrete. No maintenance necessary. Lasts for decades. Never rots. Available in black and brown. Available in 3 Sizes: Nursery, Junior, Adult. Extremely robust and long lasting. Weather Resistant all Year Round. A great addition to your bench to keep the summer sun from getting overpowering. Available in Light Oak, Mahogany and Black Walnut. Made from Recycled CD and contact lens cases. Maintenance-free, Easy to Clean and looks like wood. Wheelchair / pushchair friendly version of our very popular Derwent Range Picnic Tables. Available in Red, Blue, Green, Yellow and Multicoloured. Will never need maintenance. UV protected colours are fast in direct sunlight. 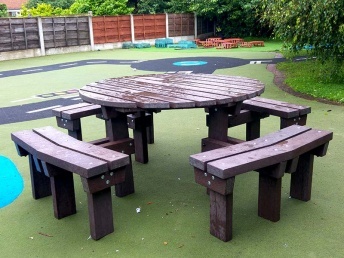 Can never rot, warp, crack or splinter and is ideal for play areas in country parks and schools. Fully recyclable, vibrant Grit Bin. Impervious to water, frost, mould and fungi. Available in 7 colours. This recycled plastic composter is a well established composting design with a difference. It will never rot, though the compost will break down beautifully. Using recycled plastic in the garden is a sensible and eco-friendly choice. Non-toxic materials suitable for organic gardening. Holds approximately 650 Litres. Recycled Plastic Fishing Pegs never rot. Guaranteed 25 years but expect them to last much longer. Impervious to water, insects, and mould and better slip resistance than wood even when wet. A traditional companion seat made from Plastic Wood that does not rot, never needs paint and is unlikely to need replacement for decades to come.